Out of Montpelier comes First Crush, an indie-pop duo set on capturing the emotional rollercoaster that is being young and smitten. Their four-song, self-titled debut EP, released under State and Main Records, travels tranquilly through a narrative forged by young love, with all its foolishness and wholeheartedness. The album begins with “Wrapped in Gold.” It is a simplistic pop tune that introduces the band’s aesthetic: melodic love songs centered on the boy/girl vocals of Robyn Peirce and Scott Baker. Taken on its own, the song seems relatively generic. However, in context, it serves as a fitting precursor to more rousing and inspired material to come. “California Dreaming” better reveals the duo’s easy appeal. This is another simple song, but Peirce’s lyrics and melody are direct and austere. In this sense, the tune is reminiscent of the Moldy Peaches or White Stripes. Pining for California is age-old pop-song fodder — Peirce even references Scott McKenzie’s “San Francisco (Be Sure to Wear Flowers in Your Hair),” singing, “If you’re going to San Francisco, I’ll wear some flowers in my hair.” But First Crush offer their own perspective in a more ominous light. “Do Over” resourcefully breaks from the clichés that hold back the first two tracks. It opens on a waltzy xylophone riff that sounds uncannily similar to the theme song of the film True Romance — which, thematically, shares some parallels with the EP. There’s a certain adolescent desperation reinforced by Peirce’s words, especially when she innocently sings lines such as, “A taste of what we could have been is better than nothing at all.” The combination of whimsy and style evokes vintage rock and roll — something along the lines of early Beach Boys or Elvis Presley’s more melodic tunes. “Too Late” opens portentously, sharing almost no similarities with the preceding tunes. It’s moody, dark and perhaps the most inspired song of the four. Concluding the narrative, it serves as a conscious paean to the folly of young love and first crushes. Sings Peirce, “I look out to reflected stares, searching for what isn’t there.” In some ways, it expounds the juvenility of “Wrapped in Gold” and “California Dreaming.” It also highlights the maturity and potential of First Crush, which in the broader landscape of a full LP may well be realized. 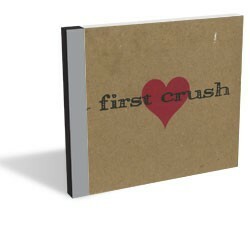 First Crush is available at stateandmainrecords.com.